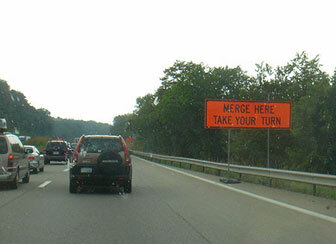 • There is less confusion for drivers in either lane - the merge point is fixed and clear. • The drivers in the continuous lane experience less anger, anxiety, disgust, and discomfort. • The drivers in the closing lane experience less scorn, uncertainty, and discomfort. • All drivers spend less time in traffic. • The trip is safer due to less confusion, less anger, and clearer procedures. • Less gas is wasted as there is less stop-and-go movement of traffic. • It is simply more civil. It allows all drivers to behave in a more cordial and more considerate manner. The feeling of trepidation over merging safely and appropriately are very real in heavy traffic situations. If you're moving at any sort of speed - be it 40 miles per hour or 70 - you don't want to make that merge at the last minute, risking the chance someone in the lane you're moving to is stubbornly unwilling to allow you the chance to get in. The Zipper is most effective during heavy traffic, so you won't likely use this if you're moving at 70 miles per hour. So don't worry about this issue if you're cruising. Just continue about your business. Frankly, the hesitation to merge at the end stems from the assumption it's every driver for themselves out there. That's not the way we should be driving! If everyone uses the Zipper, this trepidation shouldn't even exist. In order to get there, we need to collectively use the Zipper. The only reason this is even a thing is because of all the folks who are doing it wrong. This includes the folks that move over at the first sign of a need to merge - sometimes more than a mile in advance - and get irritated at those who use the lane that's left vacant. Because of folks who merge early and get frustrated, road rage becomes a major factor here. Unfortunately it's misdirected and, in most cases, the individuals getting frustrated are the ones truly at fault. The bottom line: it's not rude to use that open lane, it's actually the way things are supposed to work. Does it really move traffic faster? A 2008 study by the Minnesota DOT says the reduction in traffic backup is 40-50 percent. They also observed a safer merge and less road rage up there. Those friendly Minnesotans also discovered the Zipper put an end to the frustrations of folks trying to get to exit ramps or turnoffs blocked by that really long backup filled by early mergers. 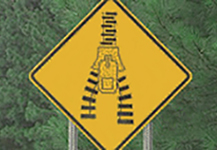 In 2014 the Washington State DOT promoted the Zipper, and the conversation started rolling. The popular tech publication Ars Technica did a piece on the issue that same year. Some are calling the Zipper, or late merge, a "new" concept, but the reality is it's been employed across the globe for some time. Some countries - like Germany and Austria - require it by law. If everyone would please take their seats, we can get started with today's lesson: When to merge into a single-file line for a lane closure and when to use both lanes until the last minute. Let's all open our minds to Page 1 of "Getting It Right On The Interstate" (by A. Harry Mess). We've all been there, sitting hostilely behind the wheel in a single line of traffic that appears to span the entirety of the Midwest. We glance nervously at the gas gauge (only half a tank!) when a car whizzes past in the right lane. We spot a pickup ahead, straddling both lanes of traffic to prevent that jerk from getting to the front of the line, and we silently thank the pickup driver: Way to go, Buddy! There's a new sign in town, and it may just change everything. 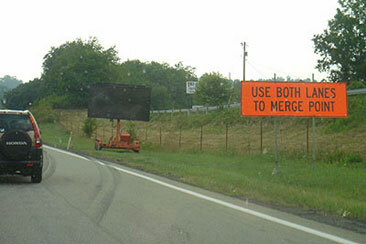 It states: "Use both lanes. 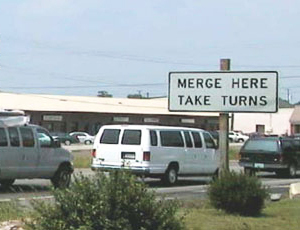 Take turns at merge." That's crazy talk, right? Everybody knows the proper way to handle a lane closure is to merge into the good lane as soon as humanly possible. 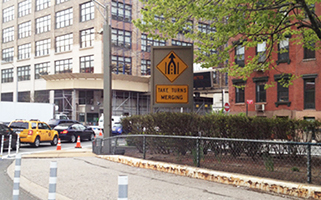 We're so inadequate at navigating lane closures, the sign is now spelling it out for us: "Use both lanes." It might as well say, "Use both lanes, Dummies." But that's cool. We can take instruction. Jan, a retired business owner: "I remember feeling angry at those people using the empty lane. Even though I would love to sneak over into the other lane, I feel guilty." Aha! Therein lies our problem: We are too polite. We would rather spend an extra half hour in a single line, cursing the passers, than risk the crooked eye from a stranger in another car. The fix for this is fairness: If everybody takes a tooth in the "Zipper" system, everyone wins. The DOT: "We're trying to eliminate long backups and trucks and other vehicles trying to straddle the lanes." Using two lanes will cut the line in half. "Once people get used to it, it works well. As long as traffic alternates at the merger, it should go more smoothly." How do people handle tunnels, construction, and so on, when driving, where the number of lanes decreases? Some people carefully get into one of the continuing lanes and wait patiently to go through the tunnel (option 1 above). All this leads to aggravation and, worse, inefficiency, since the constant stop-and-go allows less traffic to flow through than a smoothly flowing system. This, however, is the normal procedure- cars move into one lane as soon as traffic slows. This can even be miles before the merge point, such as on busy event or holiday weekends. An interesting phenomenon is the situation in which a driver in the backed up lane pulls into the free lane enough to block those cars - so they don't have an unfair advantage. This creates a dangerous environment for drivers in both lanes. The late merge produces a statistically significant increase in throughput volume for the 3-to-1-lane closure configuration and was beneficial across all factors for this type of closure. For the 2-to-1 and 3-to-2 lane closure configurations, the late merge increased throughput when the percentage of heavy vehicles was large. Field tests showed similar trends with regard to throughput. Time in queue was also reduced. There, cars all go up to the merge point, at which point the cars alternate in the use of the lane. This 'zipper' effect is done at a reasonably high speed, since there was never any question on whose turn it was. This is a great example of the value of coordination. Almost any solution where a person knows what the other people will do is better than uncertainty. 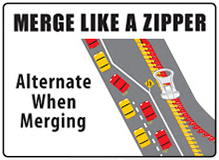 With the late merge (option 2 above), drivers are instructed to use all lanes to the merge point and then take turns proceeding through the work zone, integrating both lanes like the two sides of a zipper. A study concluded that when traffic has to merge down to one lane from two, it is more efficient, faster, and more fair for both lanes to be full up to the very final chance to merge. In some states, people will line up in one lane miles back and others will speed down the more empty lane and then merge in at the last minute. This system doesn't seem to make the people in the long line very happy. Above are some fotos from Missouri, Illinois, or Indiana showing a more efficient system. The zipper option produces a 15% improvement in traffic flow over the conventional merge.